The forecast was 90% rain, but warm. This posed a problem. A new problem for us as it turned out. "So what do we do? Raincoat?" "I didn't bring mine. Umbrellas are out of the question"
"I guess we get wet." 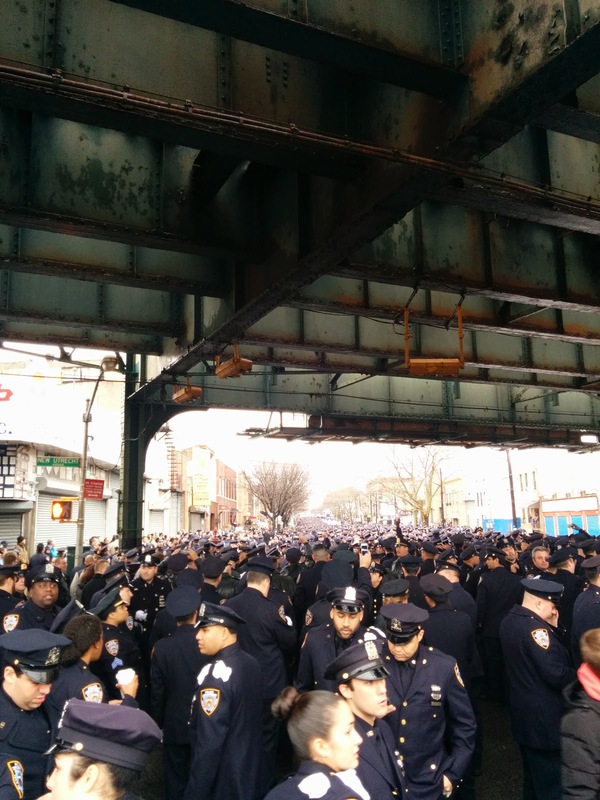 It was Sunday morning, the day of NYPD Officer Wenjian Liu's funeral. Rain was scheduled which meant you were going to get wet. The whole point of a dress uniform is to look sharp, which is defeated when covered by a raincoat. Also, you can't carry an umbrella, so that meant it was going to be a long, wet day, which seemed fitting in many ways. "Where did you get the empanadas?" "Over by the plumbing supply store. I think the DEA (Detectives Endowment Association) one has pizza." Thousands of officers from all over the country. Large contingents from LA, Chicago and all parts in between. Normally, the men and women of the NYPD's Ceremonial Unit are buzzing all over the place putting people in formation and barking orders, but they had to make do with yelling at us over loudspeakers they hung from cranes. Giving directions without seeing any of us. There were too few of them and far too many of us. It was a little bit of chaos. But like any crowd, people started moving towards 65th Street and that got everyone else moving and quieting down. This ceremony, like Ramos's the week before, was unique for me because the wake and the funeral were held at the same place. Normally, the wake is at a funeral home and then the body arrives and you salute as it enters the house of worship, along with the bagpipes, etc. Officer Liu was apparently a semi-practicing Buddhist, so they held the service in the funeral home he was waked in. So it was weird to just be standing around and hear people start talking. Another unique thing that showed the difference in how these officers were killed, asides from the sea of blue, was the video monitors they had placed along 65th St. Normally. once the service starts, they'll have a sound truck but the officers who can't fit into the church usually go find coffee or smoke a cigarette or connect with old co-workers. Not this time. The speeches came first. FBI Director Comey spoke on behalf of the federal government (Biden spoke at Ramos's), The Governor was unable to speak as he was handling the death of his father, though he did attend the wake. The Mayor spoke, and most of the people I saw turned their back. I didn't, because I didn't think it was appropriate at a funeral but not because I have any respect for the Mayor. The Police Commissioner spoke and spoke from the heart, giving the best "official" speech of the day. He spoke of how when he learned more about Ramos and Liu he wondered why it was always the good ones who were killed. He said it was simply the law of averages because the vast majority of cops are good, kind and well-meaning human beings. Then the family spoke, First came Wenjian's younger cousin to talk of how kind he was. Mr. Liu, Wenjian's father spoke next. Let me tell you that though he spoke in Mandarin, I understood every word he was saying. Grief is a universal language and it was clear to all those standing along that street, how much pain that man was in. I noticed many officers getting choked up by a language they didn't know. Wenjian's wife of three months spoke last in English, thanking the officers outside for coming and talking about how much he meant to her. This is why you come to cop's funerals. To show the parents and the loved ones that they do not grieve alone. That they are not alone. That from now until the hereafter, the department will look after them. And then there was a break for a personal Buddhist ceremony. I think. It was hard to tell because the camera feed stopped and there wasn't an announcement of when the procession would start. So with a light rain falling, Maslov's hierarchy kicked in. Officers started moving towards the restrooms and the 7-11 to get coffee and to shake hands and meet each other. I on my third sip of coffee when "DETAIL...." rang out. Cut to a scene of officers throwing coffee cups and running to get back in formation while putting back on their white gloves. "ATTENTION!" Officers now forming up ranks 4 deep, some 12-15 deep in places, standing at ramrod attention. Remembering not to lock the knees, having done this before. And silence. Dead silence. We were blocks away from the actual funeral home. Standing straight ahead, looking at the neck roll of the guy in front of you. Waiting for the next command. "PRESENT......ARMS!" The command echoing down the Brooklyn block as the fluttering of thousands of gloved hands come up to the brim of the dress cap. Taps is played by two trumpets. And as the last few notes of taps goes into the ether, here come the helicopters in the missing man formation. No more than 60 feet off the street, the beating of the rotors making your chest vibrate as you hold the salute. I catch officers from smaller departments looking up at the helicopters as they pass by. Amateurs. You never look. "ORDER......ARMS". Hands snapping back to the right sides of bodies all up and down the street. Total silence. Then come the motorcycles, hundreds of them. They seem to go on forever. Here's an awesome video shot from a motor showing the incredible turnout. If you get to 2:47 and look right past about 8 guys, that would be me. They were followed by the flower car and then the NYPD Emerald Society Honor Guard and Pipe Band. It was interesting because given the ancestry of Officer Liu, they didn't play the pipes. Just beat the drums as they marched slowly in front of the hearse. As the hearse arrived, this wave of salutes started from my left and carried down to follow his body. Salutes held for the family members in vans, and then it was over. Well, not really over. They kept us standing there for a bizarre amount of time to the point that after 40 minutes, when the pipes came back past going the other way playing, people just broke and dismissed themselves, many walking a mile back to their cars. People said the turnout was less for this one, perhaps being that it was two weeks after the shooting and on a Sunday. I honestly couldn't tell you because literally all I could see was cops in both directions and I know I only saw less than half of those there. I do know that this day reinforced my belief that you always make the funeral. I was disappointed in the low turnout from DC, given that its only a train ride away. Given how much it means to the family, you need a damn good reason not to make it.